Attitudes about Marijuana (Cannabis) are changing across the country. Research about the uses for Cannabis and Hemp is supporting its effectiveness and safety for medical and other industrial purposes. The Drug War has focused much more on Marijuana than any other of the more dangerous drugs, and has utterly failed to reduce the consumption of Marijuana in the US. 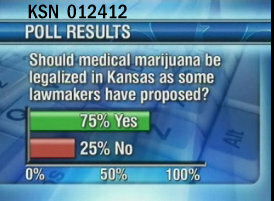 And yet, while some states have recognized the futility and harm of continuing to arrest and imprison people for their private use of Marijuana, we have work to do in Kansas before we can hope to have Marijuana available legally for patients who could benefit from it, or for others who wish to engage in adult use as an alternative to the more harmful effects of alcohol. Our mission therefore, is to educate and advocate for changes in the law in three areas: Medical marijuana, Agricultural hemp, and Legalization or decriminalization of marijuana for responsible adult use. We also work with other organizations addressing other impacts of the war on drugs, such as mass incarceration, asset forfeiture, and civil rights. Please consider becoming a member and join us in our mission to provide a voice that reflects the changing public opinion regarding the drug war, and to achieve reform of Kansas laws including the passage of legislation to allow the beneficial use of medical marijuana, responsible adult use, and industrial hemp for farming. Press "Contact Us" below to contact us. And make any donations or memberships by clicking on "Donate" below. Thank you for your interest in our mission.